$5 Early Bird Discount Tickets available at Eventbrite. 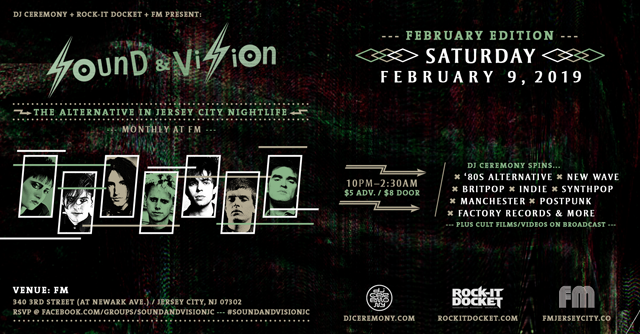 (Tickets are $8 at the door) Secure guaranteed admission to Sound & Vision. Buy here. (Useful if party attendance reaches venue capacity) Early-bird sale ends Saturday, January 19 at 5:00PM. Thanks for a great night at the January party, everyone! Mark your calendars for the next date for Sound & Vision: Saturday, February 9th, 2019. 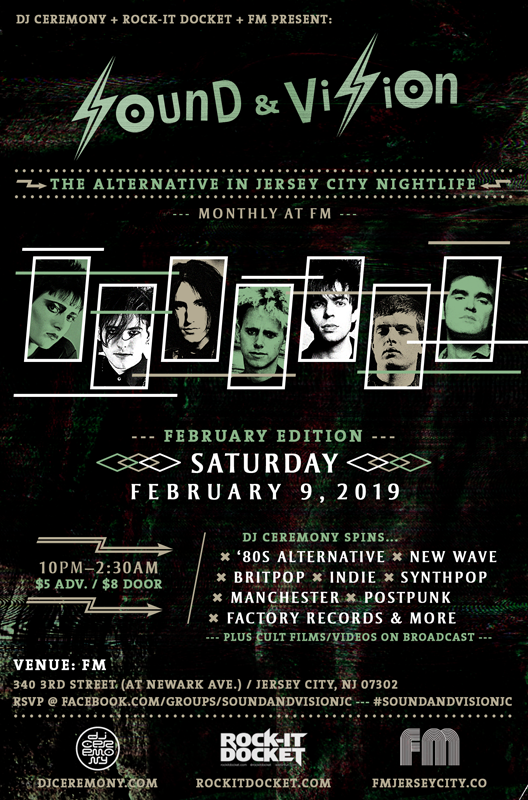 For those new to Sound & Vision, join like-minded Alternative music fans in NJ/The Tri-State for a full night on the dance floor as DJ Ceremony provides an all night soundtrack of the best in ’80s Alternative, New Wave, Classic ‘90s Britpop, Postpunk, Indie, Synthpop, Manchester, Factory Records, & more. Sign up for the DJ Ceremony mailing list for information on upcoming events and dates. You may unsubscribe from the mailing list any time by replying to any e-mail with “Remove” in the subject line of your e-mail. All graphic design by Lumina Design Lab.